The shaded numbers indicate the combinations of total market/market share that you would need to deliver. In particular, the total market has to be either three times bigger than my estimate (around $300 billion) or the market share has to be more than twice my estimate (20% and higher) to justify the $17 billion value. Uber operating asset value, holding market share and other inputs fixed. Bottom line: Can the disruption option explain the difference between the assessed value ($17 billion) and the estimated value ($6 billion, with intrinsic valuation)? It is possible but not probable. For the option to be worth $11 billion, the potential markets that Uber can enter, assuming it is successful in the car service business, will have to be at least four times larger than the base market (the $100 billion taxicab market). I know that there is talk of Uber becoming a player in a futuristic world of driverless electric cars, but even if that scenario unfolds, I don't see why Google and Tesla would let Uber have anything more than crumbs off the table. Nice post ,where do you think taxi medallion mkt should be with uber valuations higher or lower? One article said Boston mkt was higher. Thanks prof. It is really necessary to make these calculations despite the uncertainty and the need to make some assumptions. It forces you to see that the price assigned is too high relative to the calculated intrinsic value despite optimistic assumptions. Whether one acknowledges the over valuation or not is off course a different matter. I would expect them to be lower, if investors truly expected Uber and its competitors to succeed and get a large share of this market. In New York City, the effect has been muted but it is still early. I feel your argument about the disruption option being "possible but not probable", is underestimating both the potential market size and the level of innovation that is taking place. The market for Uber, in my opinion, already includes car ownership, public transportation and rental car services. "So what is that vision?… It’s a reflection of our mission to turn ground transportation into a seamless service. Basically make car ownership a thing of the past…If you just looked at San Francisco, the ground transportation market in just San Francisco — where people pay to get in a car and go somewhere, whether they own the car or otherwise — is $22 billion. No wonder we’re several hundred million in size just in SF, and growing faster this year than last year." Moreover, we also need to consider the potential of driverless cars. "The reason Uber could be expensive is because you're not just paying for the car — you're paying for the other dude in the car," Kalanick said. "When there's no other dude in the car, the cost of taking an Uber anywhere becomes cheaper than owning a vehicle. So the magic there is, you basically bring the cost below the cost of ownership for everybody, and then car ownership goes away." It's important to note that Google Ventures is a major investor in Uber and therefore a potential acquirer should driverless cars take off. The technology will confer competitive advantages to Uber that other services cannot easily match, pushing up both the margins and market share. The above scenarios are call options for sure, but considering the level of innovation going on, I don't believe they are deep out-of-the-money. I would be surprised if Google does not cause a few ripples in the car market by 2020. Your thoughts? I think there is an element missing on liquidation value, which impacts the valuation of this and other VC investments. If Uber's slowed, it is likely that it would still be able to find a buyer in the region of the billions of dollars (perhaps existing investor Google Ventures) and the current investment may well have been as preferred shares (potentially with a ratchet) or partially as convertible notes, limiting downside for investors significantly. This accounts for a higher valuation than just purchasing ordinary shares. You may be right but I think that we need more than quotes from Mr. Kalanick to increase that probability. Note that when he talks about the market being several hundred million in SF, he is talking about gross receipts, not the 20% take that Uber has. I also think that he and the driverless electric car folks are under estimating two real world variables: the first is that for many people, a car is more than a transportation device and the second is inertia: it takes a lot to get people to change. Finally, what will Uber's role be in a driverless car market? Intermediary? If so, I don't see a 20% cut going to Uber for that role. Assuming that Google has a monopoly in driverless cars(at least in its initial years), wouldn't you agree that it will be more profitable for Google to acquire or partner with Uber and create a taxi monopoly? I cannot see how selling the technology to everyone and sabotaging Uber would be more profitable instead(as Google seems to be the largest investor). Moreover, if they start selling these cars to consumers, everyone can become an Uber by renting their cars when they are free a la AirBnB, as the cars can deliver themselves. So, Google will probably not go that route until it sees some competition. Under this monopoly assumption , I think the 20% is not only fair but probably low taking into account the cost savings in not having a driver. My biggest issue with Uber is that it does not provide a value proposition to a customer unlike Airbnb or others. For example, at least in NYC, Uber service is more expensive than taxi or even a car service company like Dial7, Carmel, etc (You can price the cars your self on their websites). I don't see how the London taxi market can be bigger than the whole of the US, or how London and Tokyo together can make up more than a third of GLOBAL taxi fare turnover. Something is severely wrong with these figures. Really good analysis, gets to the core narrative of all growth investing (future real options > current business numbers). Smart entrepreneurs have always used this narrative to get high P/Es. What feeds into this is also the FOMO that most VC's have. Errors of omission are greater (missing on next big thing, i.e. not making 1000X on your investment) than errors of commission (losing 100% of your investment). Asymmetric payoffs drive these valuations. Uber is planning on (and, I believe has already done as part of a pilot program) financing vehicles for drivers. As Uber steps in to guarantee the loans, the cars will be used as collateral. Though this may open up the company to liability issues (they may have more difficulty arguing that a driver does not work for them in between fares while driving a vehicle with title held by Uber), it will turn their company towards a more traditional asset-owning cab business. Additionally, you seem to have left out the logistical side of the business. Some of the sky-is-the-limit valuations believe that Uber is going to be a boon to same-day delivery services. I disagre -- mostly because the standby competition may be more robust than anticipated and because Uber's mapping is woefully inefficient. Uber relies on Foursquare for locations. Having used Uber in a number of American and international locations, I can attest to the app's convenience, but not to its accuracy. Google and other mapping companies do a much better job and improvement will come at no small cost. The wait times are also incredibly inaccurate. The app seems to use a simple radius model when calculating ETA. While that may work in NYC's grid-like, somewhat homogeneous streets, it falls on its face in other environments. The above will be a huge impediment to the company if they want to compete with the on-the-fly logistics technology of Fedex, UPS, etc. Those companies have complicated routing algorithms much better suited to same-day delivery service than Uber. Though the company is still young and its core business is growing, the lack of adoption for their fringe offerings (helicopter rides to the Hamptons, on-demand air conditioning, sky-writing on Valentine's day, on-demand courier service) may indicate difficulty in expanding into other businesses. That is the crux of the "logistics" market, right? In effect, Uber is arguing that its market covers the movement of things and people from one point to another (thus covering package delivery, car rentals, moving etc.). The disruption option is for all of these possibilities and in sum, they do add up to a very big potential market. However, Uber's slice of these other markets is definitely not going to be 20%. Good to know about your plan and the work you are going to do is looking best for the city people. Waiting for the implementation and success for you work. Best of luck. Also, you similarly opined on Facebook's rich valuation previously. Has your view changed at all such that the company is worth $170 billion? Kevin's article is not an unreasonable one in terms of laying out the possibilities. In fact, if your question was "Is it possible that Uber is worth $17 billion or more? ", the answer is yes. However, investing is about probabilities and the list of things that have to go right for Uber to pull this off is a mile long. On a different note, while I found Facebook to be richly priced at $38, I found it cheap at $18 and chose to leave the stock at $45 (and posted at each junction). That should give you an answer as to what I think about the company today. 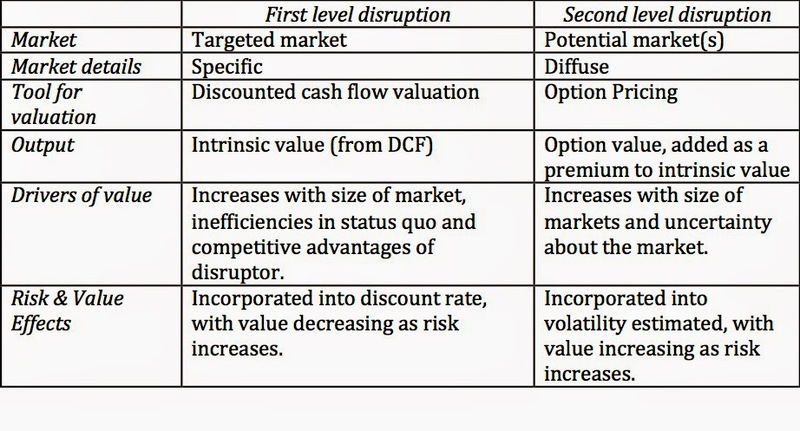 I like your discussion on disruption, and the numerous pragmatic approaches to valuation. An observation I heard once seems applicable. I think one component that is not captured completely in your analysis, and which helps bridge the gap between $6B & $17B, is the fact that UBER is absolutely bringing in new users to the taxi user pool. It is cheaper in many locations (Boston ~30%) and this is more than enough of a discount to keep incrementally adding new users to the market. I am an example of this. This is happening now, and is not a call option. A separate 'new user' revenue layer that also grows at your projected rates is an appropriate way to capture that incremental revenue and growth. Although I would apply a higher growth rate to this layer to account for more rapid uptake. As a proxy - I never took taxis previous to UBER. I now take 2-3 a week with a total spend of ~$50. This is in lieu of walking / bus to and from the train station. I don't disagree with you on your statement but that is part of the reason I allowed for a 6% growth in a taxicab market, which historically has grown at about 3% a year. If you feel that this is too pessimistic an estimate, increase that annual growth rate. Given the break-even points, you would need an extremely high growth rate to get to $17 billion. That is why even those who argue for the $17 billion value have to create new markets that Uber will be able to enter to justify that value. be expected to understand a lot of these new technologies unless you experience them firsthand. Airbnb and Tesla readily come to mind. What's the point of dog such a detailed analysis when you are off by orders of magnitude on key numbers? Mainly that uber will achieve far more than 10% of currently defined market (in fact, Travis suggested that uber sales already a *multiple* of taxi/limo sales in SF. That alone annihilates your whole analysis. If all it takes to annihilate an analysis is a throwaway comment by a CEO that is almost impossible to decipher, you are absolutely right. It is true that in face of uncertainty, you may want to go with fuzzy, feel-ggod narratives, but unless you plan to invest fuzzy dollars, it is delusional. I too am confused here, because I really dont know their operating model and the first question that arises is: why such large a funding requirement? Frankly I dont think your opinion is of the highest quality in this matter. How does the valuation change if Uber starts owning the cars (with all the cash flow) and instead of the 20% starts grossing the 100% of revenue? I think that's certainly a possibility? What are your views on potential returns for the latest round of investors? Back of the envelope, imagine they are targeting 20% return over 5 year hold, doesn't that mean that they believe that they can exit at a company valuation of 40bn or thereabouts. That feels rich to me. Great analysis professor, I just had one question about its finances, now obviously we may not know this first hand. But can someone guess as to what they need all this capital for? I mean if they're not owning cars or leasing them, it seems insane to raise 1.2B USD, surely that seems too much for R&D? 1) Uber is susceptible to undercutting of commission. How would Uber's revenues get affected if there's a new entrant in the market that guarantees 95% of the ride fare paid to the driver? 4) The only saving grace for Uber's valuation to remain true is the possibility of its demand prediction to be integrated with Google's driverless cars. Investing based on that, no matter how unreal or believable it is, is pure speculation/gamble. Awesome piece of article with a detailed information is very helpful to the users..! Excellent analysis - as usual! There is one aspect of the question that you might have left out, however. It is, arguably, more difficult to price out in your calculation. I think Uber's main target may car ownership in large, dense, urban areas, and therefore, car manufacturers. You should use the app - and you will see why. Uber has convinced me not to buy a second car - and we live in Los Angeles, of all places. The price and convenience of the service makes it so much cheaper and less cumbersome than leasing/owning a vehicle (once I added in gas, insurance, parking, maintenance and depreciation, I realized buying a second car was just not cost-effective). Uber's CEO said it himself in the WSJ - his vision is to "turn ground transportation into a seamless service. Basically make car ownership a thing of the past" (http://blogs.wsj.com/digits/2014/06/06/uber-ceo-travis-kalanick-were-doubling-revenue-every-six-months/). Most VC investments are basically a convertible note with a liquidation preference. So, this investment in Uber is most likely like a bond + warrant/option on a way out of the money call option at $17BN. The DCF method may not be an appropriate method to evaluate a convertible bond. That's the fact that global market for taxis and car services may be a big one but it very splintered, with lots of small, local operators dominating each city. Great article and a great example of a DCF analysis of a growth company. There have been a couple of comments regarding the actual deal structure and their point is valid. If the deal was not pure equity, but some kind of preferred stock, we can't simply compare the valuation based on cash flows to the implied pre-money valuation. It's the same thing as saying, in this case, that the price (what we see as the deal) is not necessarily the same as the intrinsic value of the firm. The article does bring this point up. DCF applies to firm value. new to this blog, can anyone help me understand, how professor has calculated the market share in year 1 as B3 + ($L$3 - B3)/4. Why divide by 4? Uber received $1.2b whereas your assumptions assume Uber turning cash positive after burning just $60m. Why would Uber need anything more than $60m, (and may be a little more in year 3 when it starts generating surplus op. cash)? Surely Uber & investors know something that we don't know of? So there exists a disruptive business plan, that is worth more than the current operational business and the investors believe this plan. Given the other similar valuations for other tech companies where value of disruptive option seems to outweigh operational asset value, I think the tech-investor world believes that almost all aspects of our lives would be upended by tech. And that too very soon. Disruption everywhere may be their belief. Or, the tech-investor world looks at all its investments as a portfolio expecting just a few disproportionate returns. Google invested $258 million in Uber giving the company access to Google's tech resources. I wouldn't quite rule out a collaboration between the two in the driverless car market. I'd believe six billion. Uber works very well in Seattle and most likely in a lot of cities that have relatively high density, but an urban car culture. This usually means wretched taxi service and a limited number of existing car companies, unlike places like NYC or London. Seattle is regulating Uber, and there is already an Uber drivers' association to help Uber drivers deal with Uber issues. We've used the service three times now and, unlike Seattle's existing taxi service, we had short waits (less than five minutes), good information, well maintained vehicles (e.g. working seat belts) and direct service. 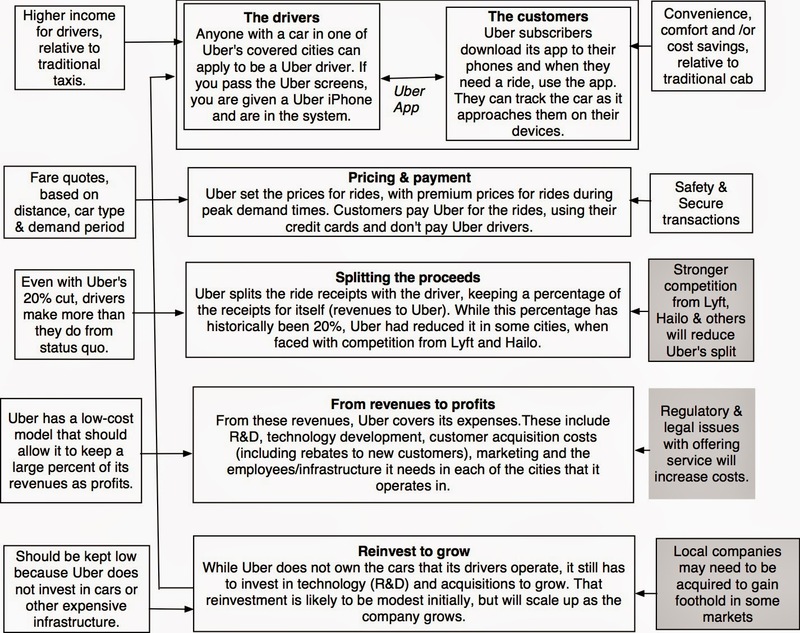 The main risk is that Uber's primary asset is software. They have smartphone applications and a dispatch system as their primary assets. In theory at least, the existing cab companies could improve their dispatch algorithms and provide similar applications, but I'm guessing that their economics will work against this. A more likely competitor would be a drivers' association adopting its own software and dispatch. I think your estimate is in the right ballpark, as it seems to account reasonably well for certain limits on the applicability of the Uber model and the limit lifetime of Uber's currently unique approach. Any thoughts on the Bill Gurley article? Thanks for Amazing Post Keep it Up. First of all, I agree with you that Uber has a very high valuation right now, and I am not personally inclined to invest with them. However, I can see a couple of scenarios where Uber is correctly valued at $17 B. First, Uber could achieve a much greater share of the market than you anticipate. It could turn out that like Facebook, the network effect is very important for Uber, and that once it attains a critical mass of users (which it may have already), this will serve as an effective barrier to entry for competitors. If Uber achieves, say, 30% of the total $100 B market in 10 years, then it is worth its $17 B valuation. Second, Uber could increase its take of the cab receipts. An increase from 20% to 40% would give it a $17 B valuation. Third, the total market for cabs may be much larger than what you estimated. I did a little digging around and came up with a $40 B estimate for the current US cab market. The world GDP is about 4.5 times US GDP, so the total market for cabs could be something like $178 B instead. A 17% share of that market gets you to $17 B. Fourth, along the same lines as the last point, the total market for cabs could grow much more quickly than you assumed. This is because services like Uber can make it much more convenient for both riders and drivers to use cabs. I'll give you an anecdotal example. My cousin, who is a well-paid engineer and is not in any way in need of spare cash, is a driver for Uber. He found that he could make an extra $20-40 per day just by taking extra passengers as he commutes to and from work each day. These are drives that he would make anyway, and now he gets paid for them. Thanks for your article, very thorough and insightful as always.